This page contains information and FAQs about BT's IP Profile and its Rate Adaptive Process used by those ISP's which use BT wholesale based products. Only BT Wholesale based products have bRAS and IP Profiles. If you are with an LLU ISP such as TalkTalk or Sky, then you wont have a bRAS or IP profile. What is an IP Profile? How is my IP profile monitored? Why do we need an IP/bRAS profile? How can I find out my IP profile? Do LLU ISPs have an IP profile? How is my IP Profile calculated? Calculate FTTC sync speed from your IP profile. What is WBC Banded Profile? What is Adaptive Max Logic? How long does it take to increase my (20CN) IP profile? My IP Profile is 'x' kbps, so what speed will I have synced at? Full list of available IP and bRAS profiles. What is a stuck bRAS profile? How does DSL Max work? The rate at which your broadband service connects to the exchange or DSLAM at and is the maximum speed your line can achieve for transferring both data and any data overheads. When data is transferred it will always have an amount of overheads. These overheads are wrappers around the data to ensure safe delivery - Similar to an envelope around a letter, they are the labels which tell routers where to send the data. These overheads can come from various Internet protocols such as TCP/IP or ATM. Data can have more than one wrapper depending upon they type of data and how it is transferred over the network. The original data which is encapsulated (wrapped) may be referred to as the payload. Throughput speed is the real time speed when you perform a speed test based on the useful data and without overheads. Throughput speed can vary depending upon various factors such as how busy (congested) certain network links are, or how fast the other end can send the data to you. So to recap: Connection speed is the maximum rate for data transfer including any overheads, whilst throughput speed is based on how quickly the useful data (minus overheads) is being transferred. ~ What is an IP profile? Your IP profile is related to the BT wholesale bRAS profile and is an indication of the maximum throughput speed your line can attain whilst that particular profile is in place. The IP profile is a limit put in place calculated from your sync speed, minus an allowance for various protocol overheads. The profile is applied at the BT bRAS to restrict the downstream data traffic speed on the backhaul between the bRAS and DSLAM. IP profile stands for Internet Protocol profile and should be a guide to the maximum speeds you see when performing a speed test. For users on a 21CN exchange, the IP profile is calculated as 88.2% of your sync speed. For FTTC/VDSL2 it is calculated as ~ 96.8% of your sync speed. ~ Why does BT apply an IP / bRAS profile? The simple answer is to stop traffic bottle-necking at the exchange backhaul VP (or SVLAN for FTTC). A maximum throughput level is needed to stop more data than your line can physically achieve being sent down the backhaul and causing packets to be dropped at the DSLAM. When we request data this will firstly comes down over high speed UK backbone (Colossus) to the RAS. From the RAS traffic will traverse the ATM backhaul where it branches off to the different exchanges. These Virtual Paths on some exchanges can be relatively small (say 20-50 MB). If you have a lot of users at the same exchange requesting data coming off the backbone fast, this could soon swamp the VPs. Therefore BT's solution is to throttle the speed of "our" data at the RAS and not allowing data to travel down the VP at a speed any faster than our connection can handle. The IP profile is a "net" figure after an allowance has been made for any processing overheads such as TCP/IP and ATM overheads. ~ How is my IP profile monitored? IP profile management is one of the duties performed by RAMBO as part of the RAP (Rate Adaptive Profile) process. RAMBO then sends this information to the bRAS where the profile is applied. More information about the bRAS control and the RAP function can be found on the DLM system page. Note: Sometimes very quick resyncs are not always detected by the Rate Adaptive Process and it is recommended to leave 1 minute between a power down and resync. ~ How can I find my IP Profile? You can find out what your IP profile is currently set at by performing a Broadband Performance Test. In addition your ISP should also be able to find out this information from data provided to them from BT called an Actuate Report. Be aware though that not all ISP Help desks will know what this is, and it isn't always information that CS support staff - particularly on some of the larger ISPs - are able to see. ~ I'm with an LLU ISP - How can I find out my IP profile? LLU based ISPs such as Sky or TalkTalk do not have an IP profile. The IP profile discussed on this page is specific to BT wholesale based ISPs such as BT retail, Plusnet, Zen etc. 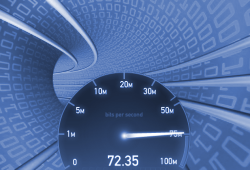 LLU ISPs may, or may not have their own methods of controlling backhaul bandwidth. ~ How is my IP Profile calculated? BT Wholesale use three different methods to calculate your IP profile. This depends on how your broadband is provisioned. ie if your exchange is 20CN or 21CN or if its FTTC. The reasons for different profile calculations is likely due to the more recent products using PTM which has less overheads than ATM. Uses the Quantisation System that should dynamically adjust the IP profile at each resync. The calculation is based upon your current sync speed minus an allowance for TCP overheads. From observations, BT would appear to be using approx 96.8% of the sync speed to calculate the IP profile for the FTTx products. Please note that if your DLM profile is set to Retransmission High, then this figure will be nearer 91% to allow for the additional overheads. With effect from late 2011, BT introduced a new Quantisation DLM system that results in much quicker updating of the IP profile. The calculation is based on your last sync speed minus an allowance for TCP & ATM overheads. The calculation should always be a fixed rate at 88.2% of your sync speed. The 'up to 8Mb' products on 20CN exchanges has set parameter bands which is based upon your lowest sync speed over a period of time. The full table is listed further down or you can use this quick calculator. ~ How often does it change? VDSL & Fibre products use the quantisation method so should be able to respond to any changes in sync speed quite quickly. ADSL2+ products for users on 21CN exchanges will utilise the quantisation method, so should be able to respond to changes in sync speed quite quickly. Up until 2011 all lines used the same method of calculating the IP profile. Now this method is only used for those people still on MaxDSL (up to 8Mbps) products who are on 20CN exchanges. Relatively few lines are still on 20CN and it is mostly restricted to those users on smaller or remote exchanges. This method is too complicated to describe in one paragraph and is covered in more depth below in the section Adaptive Max Logic. Your IP profile will continually change dependant upon the speed at which you connect to the exchange at. Good Lines will seldom see any changes, but long lines are subject to frequent changes depending upon the connection speed. Because of the way SNR behaves, most lines will achieve a better sync speed during the early part of the day than in the evenings. Unlike ADSL which uses ATM framing (PPPoA), VDSL2 uses PTM framing (PPPoE). The biggest advantage is that PTM has substantially less overheads than ATM and therefore more efficient throughput. Because of this PTM framing, the overhead allowance required for FTTC is much less than on 21CN products and is usually in the region of 3.2%. It has also been observed that lines which have G.INP retransmission applied, then the allowance for overheads is in the region of 3.3%. This figure may vary very slightly depending upon framing parameters negotiated by the modem and DSLAM and can depend upon the chipset in use. This is also why you may see some modems sync at say 79,987 rather than 80,000 kbps. Because the IP Profile makes an allowance for overheads, any lines which have Interleave High or G.INP High Retransmission DLM Profiles will find the additional redundancy increases the total overhead allowance to circa 8-9%. ~ What is my FTTC sync speed? Consumers who were issued with an Openreach ECI or Huawei modem have no way of accessing line stats without unlocking these modems. However, it is possible to reverse engineer an approximate sync figure from your FTTC profile. This method may vary by a few kbps due to reverse rounding and the afore mentioned framing parameters, but it should give you a rough idea. To improve accuracy you can tick the relevant check boxes if any of the following applies. If you are unsure, leave blank. Huawei - If you are on a Huawei cabinet and are using a Broadcom based modem. G.INP - If your line has G.INP retransmission. Accuracy can be improved if you know you are on a Huawei cabinet and are using a BCM based modem. Bald Eagle1 first discovered that using the figure of 96.79% gave high rate of accuracy when using a HG612 and he also noticed in 2015 that it was 96.69% for lines which had G.INP applied. It has been proven in March 2016 that these exact figures do not work with Lantiq based devices (such as the ECI modem/HH5A) - regardless if you are on a Huawei or ECI cabinet. WBC Banded Profiles apply to adsl lines on BTs 21CN network such as adsl2+. Banded profiles may be applied to lines that have difficulty maintaining sync at the higher speeds. The theory is to stop lines initially syncing too high at a speed which cannot be sustained and would normally encounter frequent disconnections and slow throughput speeds due to a high number of errors on the line which causes data to be retransmitted. The list on the right shows the available banded profiles which may be applied by the DLM. ~ What is "Adaptive Max Logic" for 20CN ? Previously your IP profile would be amended within 75 mins for a decrease in sync speed, or after 3 days for an increase in sync speed. Obviously this arrangement wasn't always the best solution since it could take several days to recover from one bad sync period such as during a thunderstorm. With effect from Aug 2007, BT will introduce "Adaptive Max Logic" which will replace both the 3 day system and Blip logic. This should be of benefit to those who have suffered from an unusually low sync, although smaller increases will take a bit longer. Decreases in sync speed will still reflect in the IP profile within 75 mins. Increases in sync speed will depend on the percentage of the increase and will vary between a few hours and up to 5 days. A large % increase in sync speed should see the IP profile rise within 4-6 hours, whilst a small increase may take up to 5 days before the IP profile reflects the change. BT estimates that under "Adaptive Max Logic" more than 60% of increases will now occur before they would on the old 3 day system. 1. - Large increase - Line dropped to a 576 sync during a thunderstorm (profile = 500), after a resync it went back up to 7616 (profile 6500). Profile increase = 6000/500 *100 = 1200% increase which should occur in 4-6 hours. 2. - Small increase - Sync increase from 7616 (profile 6500) to 8128 (profile 7150) after interleaving removed. Profile increase = 650/6500*100 = 10% which may not take effect for 5 days. How long it exactly takes for increases to be applied would also seem to depend on how busy the system is. According to BTw, the first Data Rate should be set within 75 mins of going live on maxDSL. Most customers will find that their line has a profile set at the bRAS within 3 days, although it can take up to 10 days for some lines to fully stabilise. For Users on a 20CN product, the IP / bRAS profile is based on your lowest sync speed, and jumps up in 0.5Mb or 0.25 Mb stages. So although you may get higher sync speed, your bRAS profile will limit you to what throughput speed you are likely to achieve. ~ How long will it take for an increase to occur on 20CN products? The figures below give a rough indication of how long changes are scheduled to occur after an increase in the IP profile. The Percentage Increase in IP Headline Rate = Period before the BRAS profile changes begin. Remember that some ISPs need to increase their own systems accordingly in line with BT's, which may take a little longer to process. ~ My (20CN) IP profile is "x" so what speed must I have synced at? Whilst I cant tell you the exact figure - it is possible to calculate which range of figures your lowest sync speed will have been in. ~ Full list of available IP & bRAS profiles used by BT Wholesale & BT Openreach. Calculated as 96.8% of the sync speed. Note: Figure is 91-92% for lines which have High Re-tx DLM profiles. Calculated as 88.2% of the sync speed. Although not quite so common these days as when adslMax was first introduced, there is still the odd occasion when a line seems to get what is known as a stuck bRAS profile. It is rare to see a stuck bRAS profile on 21CN or NGA. When your line is first profiled the theory is that the DLM system should set your IP profile in line with your sync speed within the first 75 mins. If a profile is not correctly set then the default value of 2048/2000 is used. This may clear within 3 days and it may help if you say leave your router switched off overnight... but some lines just seem to get "stuck". From my own observations this mostly appears to happen on the better quality lines - ie ones that don't loose sync or need any automatic DLM configurations. If you suspect a stuck bRAS on your line then you will have to contact your ISP asking them to get BTw to clear a stuck bRAS profile fault. ~ How does DSL Max work? For more information on how Max DSL works and how its different from traditional adsl - see How DSL Max works and What is MaxDSL? . In particular look at the DLM process to see how it is responsible for the bRAS and IP profile.